Midtown Comics at New York Comic Con 2014! Where do we even begin? Like always, we had a blast at this year’s New York Comic Con 2014! Our Midtown Comics booth #2036 was constantly packed all weekend long with comic book fans of all ages—some new faces and some familiar faces as well! We also had the chance to interview some awesome cosplayers, some old friends of Midtown, and some Zombie crawlers! Read on for exclusive coverage of this year’s NYCC 2014! Gavin, Sam and Ted talk about their 2014 New York Comic Con experience last week in this double sized episode! At the con we got to talk to creators James Tynion and Eryk Donovan of Memetic, new Batgirl artist Babs Tarr, Cliff Chiang, Joe Quinones, Greg Pak, Amy Reeder, Brandon Montclare, Kieron Gillen, Jamie McKelvie, Matt Wilson, Anthony Del Col, and Matt Kindt. Dimitrios chatted with some cosplayers as their characters and we finally resolve a burning question that has been haunting us. Then we you our top picks of the week and what we’re looking forward to next week and answer some listener questions. If you have any suggestions for the show please let us know through our Twitter, Facebook or email podcast@midtowncomics.com. Call our voice-mail at 980-MIDTOWN and we’ll play it on the show. Ted, Sam, Gavin, Andrew, and Dimitrios talk all about the Midtown Comics events at New York Comic Con 2014 in this episode recorded earlier this week. We talk about our con experiences, our special wax figure at the con from our friends at Madame Tussuads, Cosplay Bingo, the panels that we’re looking forward to this weekend, and a reward for saying hi to us at the con. We talk our hot picks for next week and Dimitrios gives us a update on his Frankenstein Vs. Dracula comic! As always visit midtowncomics.com for all the comics we talked about on this episode and have them delivered straight to your door! Midtown Comics at New York Comic Con 2014! Exclusives, Contests, and New Wax Figure from Madame Tussauds New York! We’re back for another fun-filled weekend at New York Comic Con 2014! 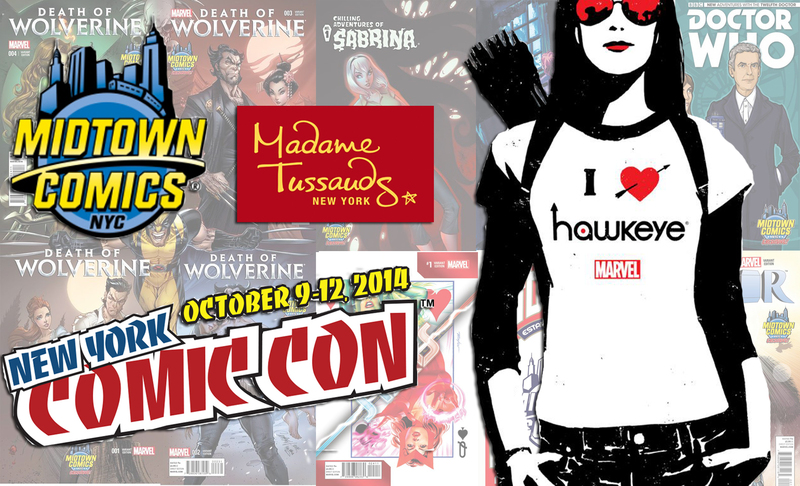 Midtown Comics’ booth #2036 is THE place to be at NYCC as we present EIGHT new variant comic book covers, FOUR new exclusive T-shirts, THREE exclusive Batman New Era Hats, a Hawkeye wax figure from Madame Tussauds New York , and a number of contests, prizes, discounts, and more! 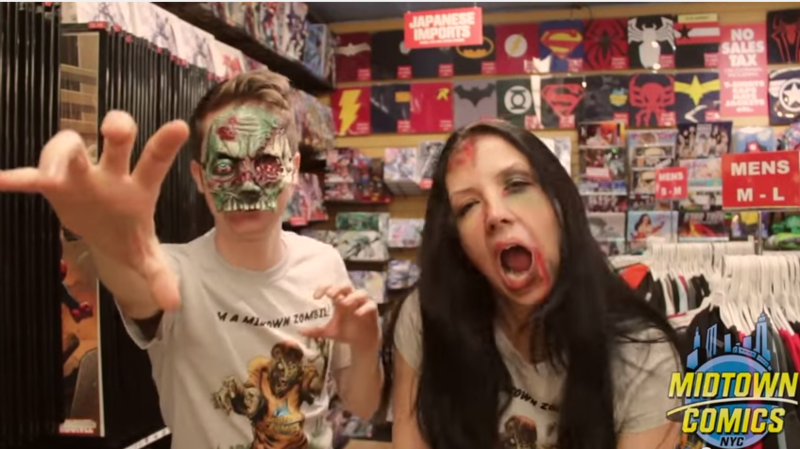 Midtown Comics Zombie Crawl T-Shirt Contest! In honor of our brand new exclusive “I’m a Midtown Zombie” T-Shirt designed by Chris Bolson, we’re giving away 20 shirts to some lucky NYCC 2014 Attendees! To win a shirt, you must take place in our Midtown Comics “Zombie Crawl” on Saturday, October 11th at New York Comic Con booth #2036! Sound like a fun time? Learn how to enter below! The contest is now over, but you can still get added to the wait list by emailing marketing@midtowncomics.com with proof of your Saturday NYCC 2014 passes! If you don’t make it on our list of 20, fear not! You can still participate in the crawl by purchasing our zombie shirt at the con! 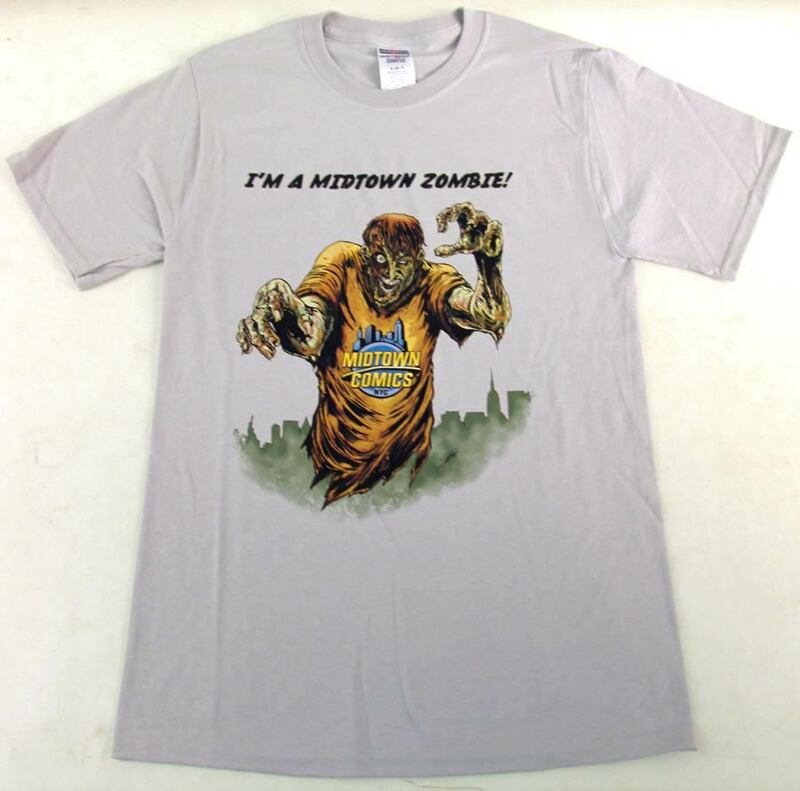 Those who are chosen will be asked to wear their new “I’m a Midtown Zombie” T-Shirts as well as zombie makeup (we’ll provide if needed) for the crawl. All 20 of us will then walk/crawl through the con in our T-Shirts and zombie makeup. We will likely be filmed by Midtown Comics and pose for photo opps as well. The best looking/acting zombies in the crawl will be awarded additional prizes! After the crawl, both the shirt and the memories are yours to keep!! Good luck, fellow Midtown Zombies! !